What does an asterisk (*) mean when shown beside a field name in the attribute table? What does an asterisk (*) mean when shown beside a field name in the attribute table? I would think those are reserved field names but they are not. The asterisk means that the field has an index. A Shapefile does not have any indexed fields by default, you need to add them. A GeoDatabase Featureclass always has a spatial index on the Shape field and attribute index on the ObjectID. Not the answer you're looking for? Browse other questions tagged arcgis-desktop arcgis-10.0 esri-geodatabase attribute-table or ask your own question. Attribute table field value question? 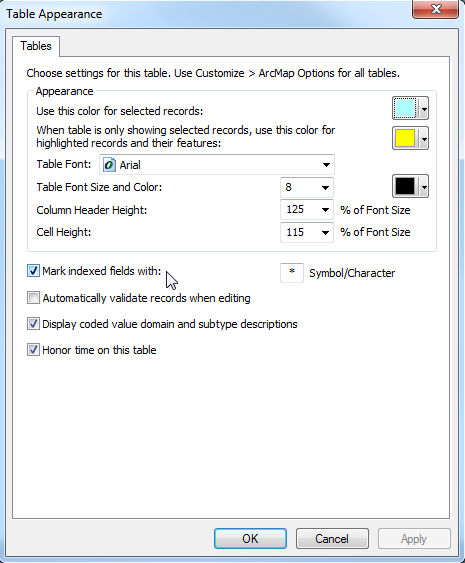 What is the strategy to add attributes to shapefile when the number of records are not the same?